Added storage. When you have limited cabinet and drawer space to store your kitchen essentials, cooking a meal can be challenging. It takes extra time to retrieve utensils or pots and pans when they’re crammed or stacked in tight spaces. You may find yourself using limited counter space to store things, whether for convenience or simply because there’s nowhere else to keep them. That’s one of the greatest benefits of an island—it gives you the extra storage you need. Even a small 4’ x 3’ island with a simple drawer and shelves beneath it can give you extra space to store items such as utensils or pots and pans; cookbooks; small appliances such as crockpots, toasters, or blenders; or cooking staples such as spices or baking ingredients. Having those items within convenient reach can greatly improve your workflow when you’re in a hurry to get a meal on the table. Extra seating. Ever noticed how when you’re cooking in the kitchen, people just seem to congregate there, whether it’s your dinner guests, your kids, or your spouse? An island with a few bar stools makes a great place for people to sit and visit with you while you’re preparing meals. Islands make good locations for kids to do their homework, and they’re nice when you need a quick place to enjoy a cup of coffee, eat breakfast, or have a snack. And when you’re hosting a large gathering, you’ll be glad to have the extra seating options for your guests, especially if you have limited seating at the kitchen or dining room table. Additional counter/food prep space. Nobody ever complains about having too much counter space, so the added counter space from an island can be a huge bonus. Whether you need a place to cool some cookies after they come out of the oven, or a convenient location for food prep, an island expands the amount of workable space in your kitchen. Potential location for built-ins. Islands are conveniently located in the center of your kitchen, so if you have the space for a larger island, they make a great place to add built-ins such as dishwashers, microwaves, or prep sinks. Built-in microwaves can be placed low enough for kids to reach them, and having them in the island frees counter space or space above your range. Even just having a couple extra outlets built into an island can be helpful when you need additional places to plug in kitchen appliances or charge electronic devices. Islands can also include handy built-ins for large items such as trash containers or standing mixers. Great for when you have company. When you’re hosting a buffet-style meal for a large group, it can be tough to find space to spread out all the appetizers, salads, hot dishes, desserts, and drinks you’re serving, especially if your guests are bringing food to share. 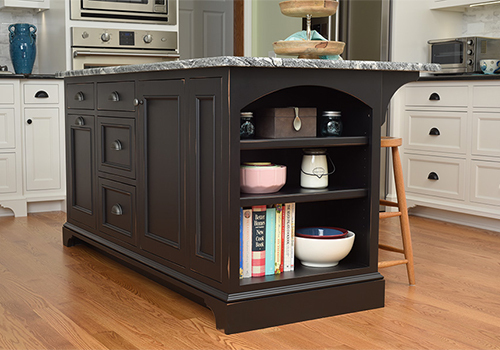 The extra counter space on an island can be used to set up “stations” for specific items such as drinks, appetizers, or desserts, or you could use the island as a handy place to keep all the utensils and dinnerware your guests will need. If you have additional outlets built into your island, it can also be a convenient place to plug in a couple extra crockpots when you run out of counter space. They make a great place to display decorations or healthy snacks. The kitchen is a busy place—the hub of activity—and adding personal touches can make it feel welcoming and comforting as you spend time there. Islands provide a central spot to display your favorite decorations, whether it’s a vase of fresh flowers, your favorite scented candles, or a decorative bowl or basket. Displaying a bowl of fruit in the center of your island is a great way to keep healthy snacks within convenient reach for your family. Are you convinced that an island could be the perfect addition to your kitchen? We can build custom islands that are sized right for your kitchen and fit your specific needs, and we can match your kitchen’s current style or design something that’s made to stand out! Give us a call to get started!